The Pacific Crest Trail (PCT) is the crown jewel of America’s scenic hiking trails, spanning 2,650 miles from Mexico to Canada through three western states. It leads the hiker through the beauty of the desert, unfolds the glaciated expanses of the Sierra Nevada, and provides commanding vistas of volcanic peaks and glaciers in the Cascade Range. Thousands of hikers enjoy this national treasure each year. Some only travel a few miles, while others follow the trail through in a single season! The route was first explored in the late 1930s as a potential border-to-border recreational trail corridor. Initially, the trail consisted of disconnected trails along the crest of each state. 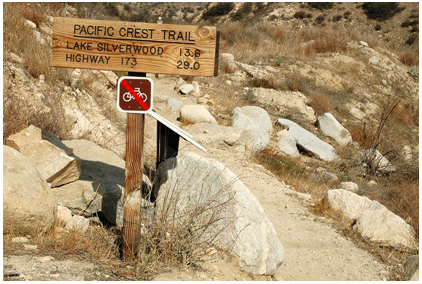 The PCT was eventually designated one of the first National scenic trails and was dedicated in 1993. 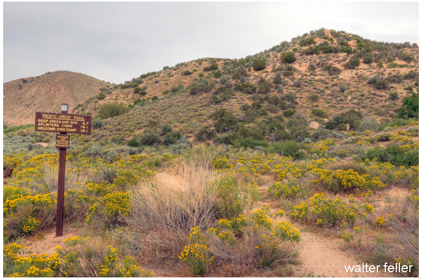 The PCT begins on a low hill near a small town near the Mexican border named Campo (elev. 2,600'). It then climbs through chaparral, scrub oaks, and pines then dips into Anza-Borrego crossing Highway 74 at 4,900' and again climbing the backbone of the San Jacinto Mountains. At 9,030' the trail plunges to its lowest point at 1,190', crossing beneath Interstate 10 in the San Gorgonio Pass. At this point the trail enters the Transverse Ranges of the San Bernardino and San Gabriel Mountains. 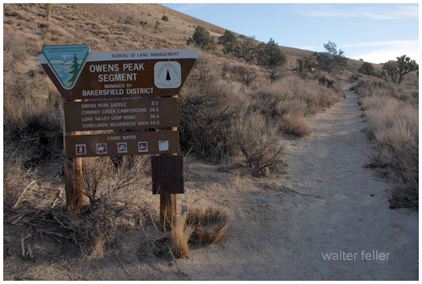 The PCT climbs the steep slopes of these east/west-oriented mountains containing climate, geology, flora, and fauna unique to the Southern California section. The orientation of the mountains along this section of trail often provides the welcome shade of the thick forests at the crest of the range and passes through the Big Bear Lake and Lake Arrowhead areas. Descending Deep Creek the PCT finds its way to Silverwood Lake then west to the Cajon Pass where it dips under the I-15 freeway between the San Bernardino and San Gabriel Mountains. From the Cajon Pass the PCT climbs up to the Blue Ridge and follows it west, south of Wrightwood and onward to Mt. Baden Powell. Views of the Swarthout Valley and further out to into the Mojave Desert lie to the north and the eastern San Gabriel River Canyon and Los Angeles Basin fall to the south. From Mt Baden-Powell west the trail braids along scenic Highway 2 descending to and crossing Highway 14 near Vasquez Rocks in Agua Dulce. Crossing the scrub and brush of the transition to the Mojave Desert the PCT continues north to the Tehachapi Mountains across Highway 58 and entering the Sierra Nevada to Walker Pass at Highway 178 at an elevation of 5,246'.